This card’s for the Sketch Challenge today over at Splitcoast. An awesome layout that lends itself to so many different ideas. I chose to make a wreath based on one of Kittie Caracciolo’s designs. The card base is a standard A2 in SU’s Basic Gray. 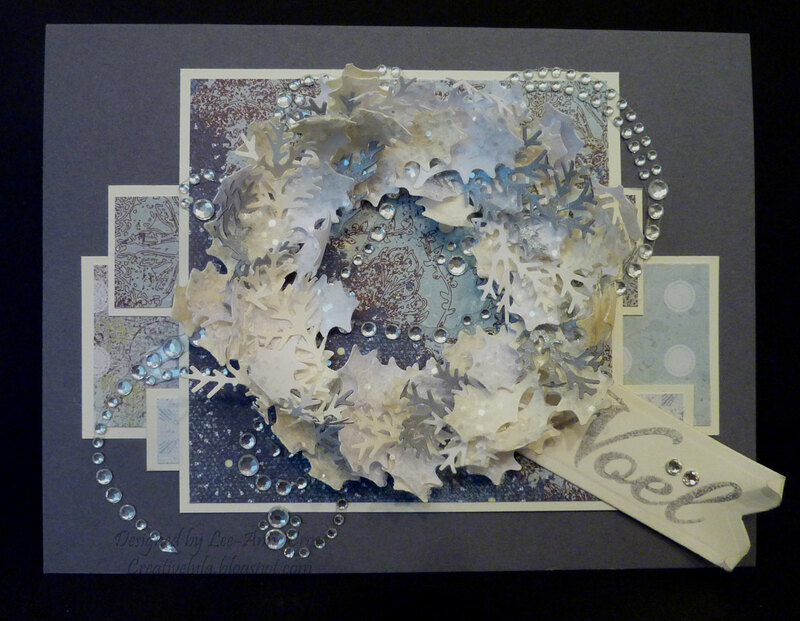 Next comes layered pieces of designer paper that are framed in SU Very Vanilla. On top of all those layers is a big piece of bling from Recollections. The sentiment was stamped off before stamping it in Basic Gray on the vanilla cardstock. Next it was cut with a Spellbinders Nested Pennants die. The edges were curled for a little interest and a couple of rhinestones were added as the accent above the “e”. On to the wreath. First I punched a whole lot of the Martha Stewart Holly bits and MS Branch bits in Very Vanilla, Brushed Silver and Whisper White. Next, using a stylus and mat I shaped each punched bit. Then, using a toothpick, Crafters Pick glue was applied to each of the holly bits and it was dipped in MS Coarse Glitter. It was a random process,using the toothpick to dot on the glue here and there on each bit. Then, the wreath was assembled on a base made by cutting a piece of Very Vanilla with a 2″ Spellbinders die and the next size down die at the same time. This provides a 1/4″ wide circular base for the wreath.